Things finally seem to be moving along with our new house, which is under construction just across town. 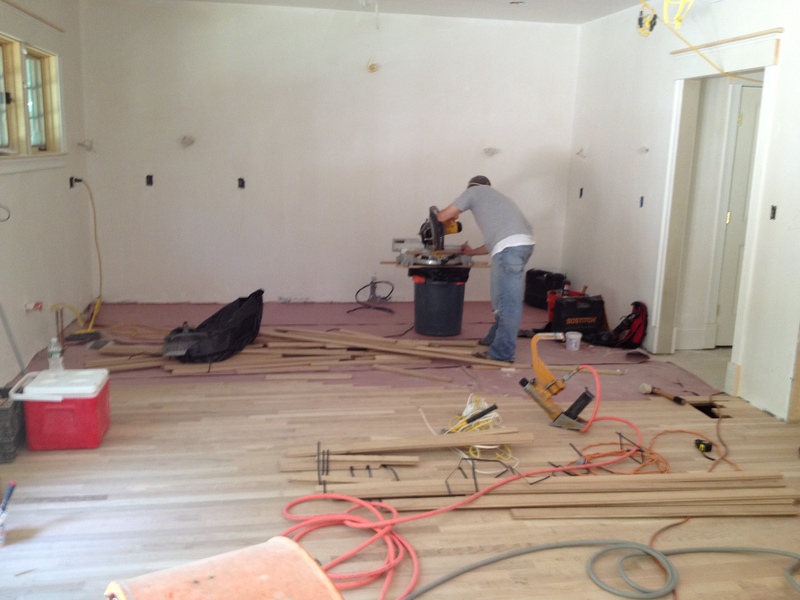 The hardwood floors are being laid, and most of the trim is in place. 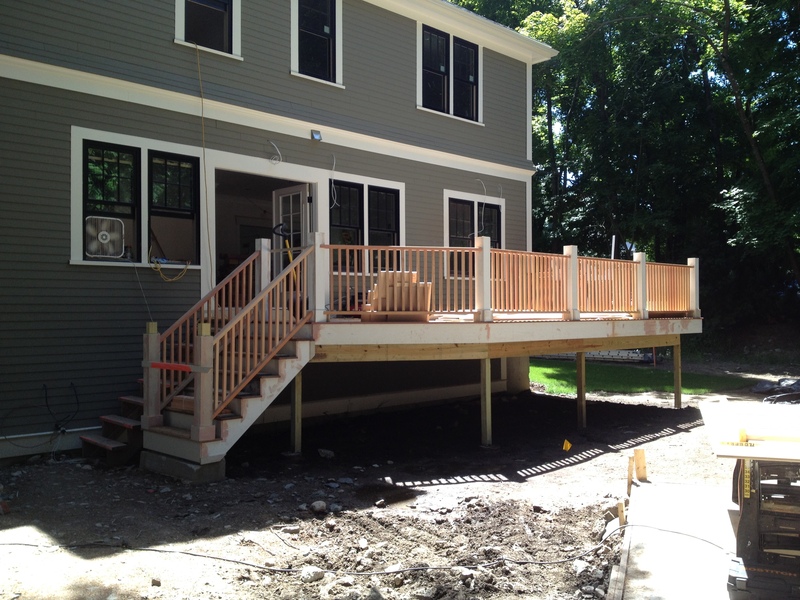 Our deck is also mostly finished, and interior painting and tile installation are up next. Here are a few snapshots from the past couple of days. Bear in mind I took them with a phone while carrying a 22-pound toddler in a Baby Bjorn in 85+ degree heat and no climate control :). The back deck. It’s nice and long, with plenty of room for a big grill, which is one of two areas of which my husband is 100% in charge (the other being audio/visual). 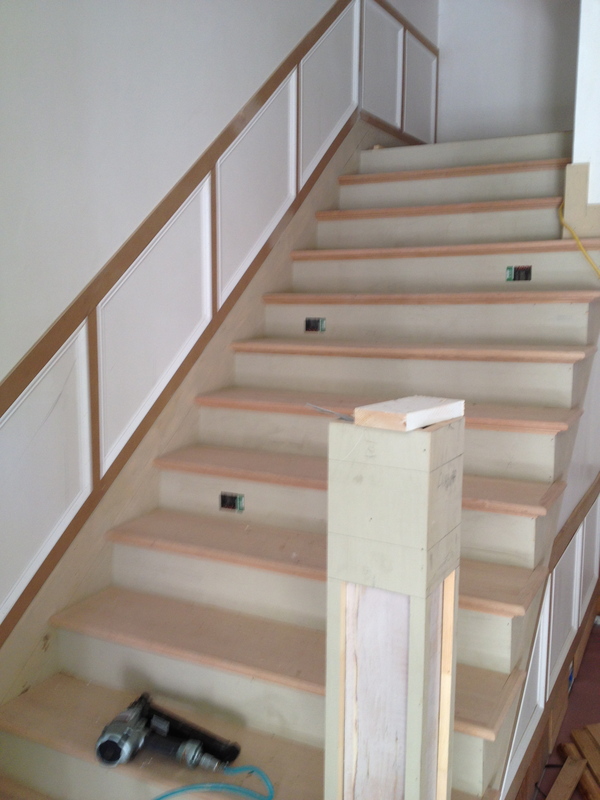 A blurry front staircase. The newel post is a work in progress, but I designed it to have some heft, and a very simple raised panel design with a flat-ish cap. Lovely mantel, isn’t it? Unfortunately, it was in the wrong place. This one belongs in the adjacent living room. 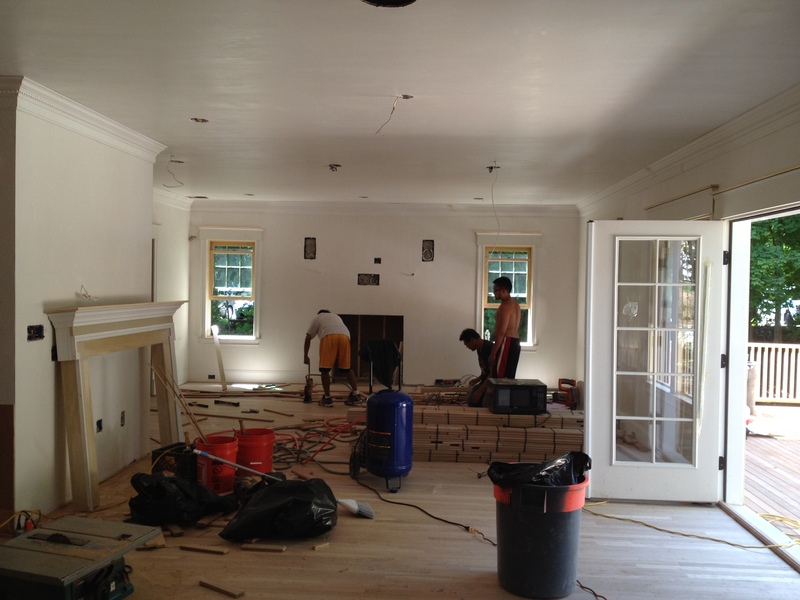 Standing in what will be my kitchen, looking into the family room. A built-in “mother’s desk” (note to self: need a new name for that) is being installed where you see the mantel (now removed) propped up against the wall. Laying down floor boards in the kitchen. 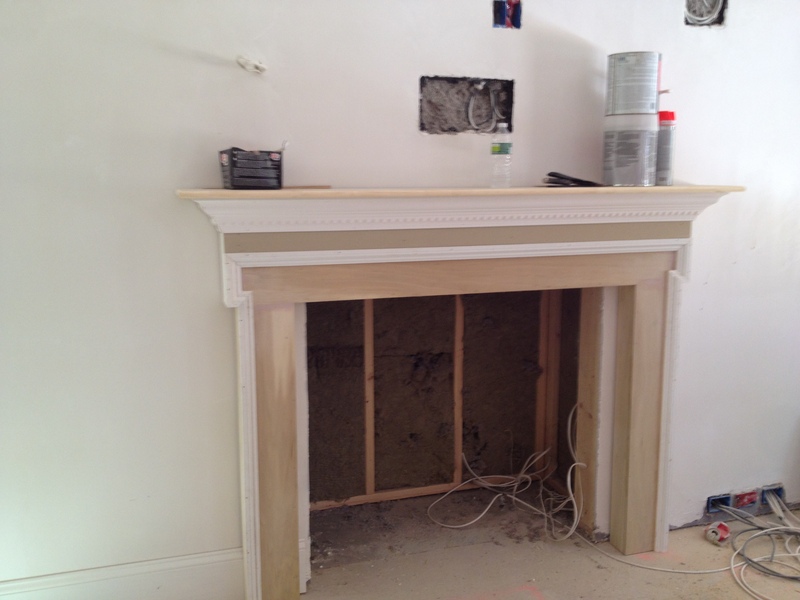 It’s going to look so different once the cabinetry is installed! A close-up of the crown moulding on the first floor. 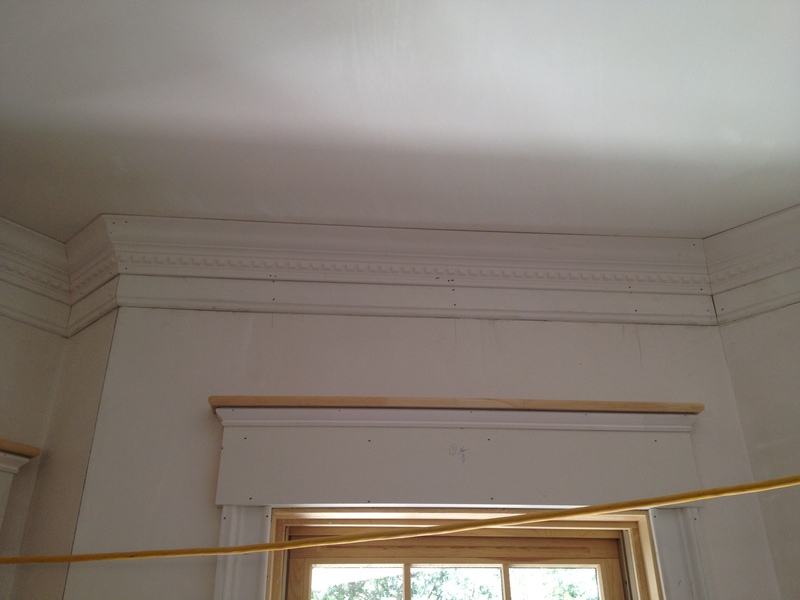 The dentil moulding was an interesting surprise – not what I had originally picked (and not what the builder ordered), but it arrived and I like it. It’s just classic. I adjusted the living room mantel design to incorporate the motif, as well. I hope you enjoyed this sneak peek inside this very active construction site! Love the peek! Everything is looking great. I’m sure this makes you so excited for what lies ahead. Once the kitchen cabinets get installed you’ll just start to feel like it’s home. Kitchen’s just seem to do that. It’s a wonderful space. Show more as you can… it’s so fun to see. Love it. Thanks, Stacey! Some days I feel like this thing will never be finished. Seeing the progress really helps. I agree that the cabinetry installation will be a big turning point. That, and when there is finally some COLOR up in here! Won’t be long… Thanks again for checking in! Looks great, Kelly! Love the open spaces and continuity out onto the deck. It’s really coming along now!